The global radiation therapy market is driven by increase in patient population, rise in health care infrastructure in developing countries, surge in product approvals, high research and development activity, technological advancements, and rise in government initiatives. According to the American Institute of Cancer Research, nearly 18 million cancer cases were diagnosed globally in 2018. The global radiation therapy market has been segmented based on type, end-user, and region. In terms of type, the global market has been bifurcated into external-beam radiation therapy and internal radiation therapy. The external-beam radiation therapy segment has been classified into conformal radiation therapy, proton beam radiation therapy, image-guided radiation therapy, stereotactic radiation therapy, and others. The internal beam radiation therapy segment has been categorized into brachytherapy and systemic radiation therapy. The external-beam radiation therapy segment is anticipated to account for major market share during the forecast period. The segment’s dominance is attributed to increase in product approvals, technological advancements, rise in strategic collaboration between hospitals and manufacturers, and surge in demand for non-invasive procedures for cancer treatment. For instance, in February 2017, ViewRay, Inc. received 510(k) clearance from the FDA to market MRIdian Linac system. In terms of end-user, the global radiation therapy market has been divided into hospitals, specialty clinics, and others. The hospitals segment accounted for major market share in 2017 owing to increase in incidence and prevalence of cancer, and rise in collaboration among major manufacturers to build efficient radiation therapy facilitates. In November 2018, Mevion and Chengdu Xingcheng entered into a strategic agreement to build a leading proton therapy center in Chengdu, China. Based on region, the global radiation therapy market has been segmented into North America, Europe, Asia Pacific, Latin America, and Middle East & Africa. North America accounted for the largest share of the global market in 2017. Rise in prevalence of cancer, surge in health care expenditure, increasing strategic collaboration between manufacturers and hospitals to set up advance and efficient radiation therapy centers, rise in mergers & acquisitions, and surge in demand for non-invasive procedures are projected to drive the market in the region during the forecast period. Rise in demand for efficient systems for treatment of cancer in emerging economies such as China and India, growing health care industry, and rapidly increasing patient population are anticipated to fuel the growth of the market in Asia Pacific from 2018 to 2026. 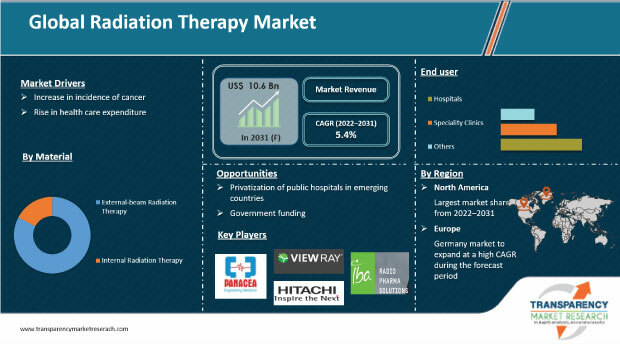 The radiation therapy market in Latin America and Middle East & Africa is expected to be driven by rise in government initiatives to promote better health care facilities and increase in investment in health care sector during the forecast period. Growth of the health care industry, increase in the number of product approvals, and rise in demand are the other factors likely to augment the market in these regions during the forecast period. Major players operating in the global radiation therapy market include Elekta AB, Varian Medical Systems, IBA Radiopharma Solutions, Accuray Incorporated, Isoray, Inc., Mevion Medical Systems, Hitachi, Ltd., ViewRay, Inc., and Panacea Medical Technologies Pvt. Ltd. Increase in mergers & acquisitions, new product development, and strategic collaboration between major companies and governing authorities are expected to drive the global market during the forecast period. On December 7, 2017, Hitachi, Ltd. and Mitsubishi Electric Corporation signed an agreement to transfer Mitsubishi Electric's particle therapy system business to Hitachi and integrate to one entity. This report analyzes the current and future scenario of the global radiation therapy market. Increase in patient population, expansion of health care infrastructure, and technological advancements are projected to drive the global market during the forecast period. The global radiation therapy market report comprises an elaborate executive summary, which includes a snapshot that provides information about various segments of the market. It also provides information and data analysis of the global market with respect to segments based on type, end user, and region. A detailed qualitative analysis of drivers and restraints of the market, and opportunities has been provided in the overview section. Additionally, the section comprises competitive matrix and company profiles along with business overview to understand the competitive landscape in the market. This section of the report also provides market attractiveness analysis by region and market share analysis by key players, thereby presenting a thorough analysis of the overall competitive scenario in the global radiation therapy market. Based on type, the global radiation therapy market has been segmented into external-beam radiation therapy and internal radiation therapy. The external-beam radiation therapy segment has been divided into conformal radiation therapy, proton beam therapy, image guided radiation therapy, and others. The internal radiation therapy segment has been bifurcated into brachytherapy and systemic radiation therapy. The segments have been analyzed based on available radiation therapy systems used, and cost-effectiveness of treatment. In terms of end-user, the global market has been classified into hospitals, specialty clinics, and others. The market size and forecast for each of these segments have been provided for the period from 2016 to 2026, along with their respective CAGRs for the forecast period from 2018 to 2026, considering 2017 as the base year. In terms of region, the global radiation therapy market has been segmented into five major regions: North America (U.S. and Canada), Europe (U.K., Germany, France, Spain, Italy, and Rest of Europe), Asia Pacific (India, China, Japan, Australia & New Zealand, and Rest of Asia Pacific), Latin America (Brazil, Mexico, and Rest of Latin America), and Middle East & Africa (South Africa, GCC Countries, Israel, and Rest of Middle East & Africa). The market size and forecast for each of these regions and the mentioned countries/sub-regions have been provided for the period from 2016 to 2026, along with their respective CAGRs for the forecast period from 2018 to 2026, considering 2017 as the base year. The research study also covers the competitive scenario in these regions. The report profiles major players in the global radiation therapy market based on various attributes such as company overview, financial overview, product portfolio, business strategies, and recent developments. The major players profiled in the market report include Varian Medical Systems, Elekta AB, IBA Radiopharma Solutions, Accuray Incorporated, Isoray, Inc., Mevion Medical Systems, Hitachi, Ltd., ViewRay, Inc., and Panacea Medical Technologies Pvt. Ltd.